Welcome to the 33 Sacred Robes, an International Project to introduce 33 Spiritual Elders and their multi-cultural, multi-spiritual wisdom. 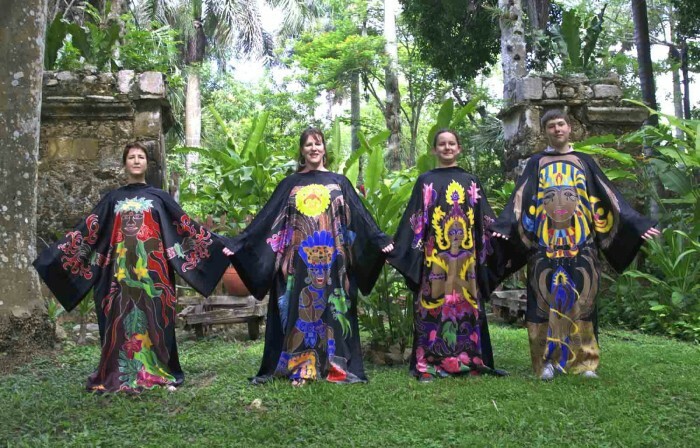 The 33 Spiritual Elders are hand-painted onto 33 silk Robes designed and created by Megan Wagner for teaching, healing and ritual. The 33 Spiritual Guides on the Robes transmit important wisdom for us today. For the past few years Megan, Diane and The Grand Council have been meeting weekly to develop a Robe Show to share the deeper wisdom of the 33 Robes. We do this through through music, sound, live performance and ritual providing an embodied experience of spiritual wisdom needed on Earth at this time. The Sacred Robes go on the road in 2018. Source, Renewal, Nurturing, Play, Passion, Peace, Joy, Guidance, Imagination, Balance, Truth, Breakthrough, Awareness, Determination, Strength, Compassion, Power, Inspiration, Acceptance, Courage, Love, Knowledge, Understanding, Wisdom, Trust, Creativity, Transformation, Mastery, Liberation, Healing, Vision, Manifestation and Integration. When people wear the Robes, they receive love, inspiration, wisdom and nurturing. They literally step into a reservoir of the specific energy held within each Robe. For example, Courage, Acceptance, Creativity or Liberation. People then have these energies and consciousness for their own spiritual evolution. When people wear the Robes they receiving healing, helpful information, answers, spiritual transmissions and experience energy shifts, visions and bliss.